LETTER FROM THE HEART ~ Don't Close The Lower Gorges of the KaitunaRiver. by Ollie El-Gamel | DBP MAGAZINE ONLINE The World's Best Free Whitewater Publication. Ollie sending California Slide in Smokey Gorge. The line is tuck under the log. My name is Ollie El-Gamel and I am a whitewater kayaker. What does that mean? Well, it means I like to push myself in an inherently dangerous environment and explore the natural wonders dotted around the globe that we like to call rivers. If you ask any kayaker about the risks involved in the sport they will tell you plainly and simply you can drown, just the same as in any body of water. This is why we routinely practice and undertake swift water rescue training courses, so that if anything does go wrong we have the knowledge and the capability to preform a successful rescue. We love what we do and we accept the risks that come with our natural playground. Every body of water has the potential to kill, just like any logging truck you pass on the highway. 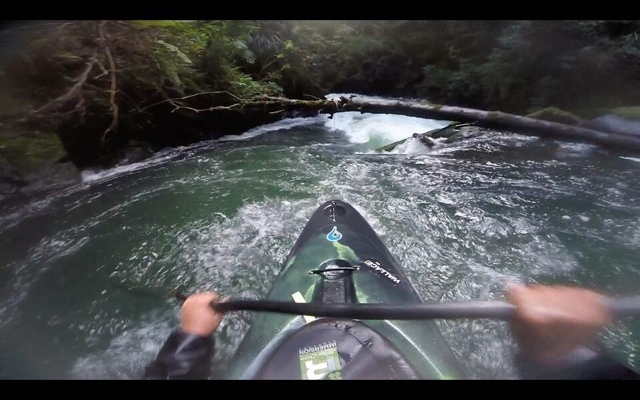 ​The lower gorges of the Kaituna River are absolutely astonishing, and the only way to access these national treasures is via kayak, and the only way to navigate a kayak down the complex rapids found within the steep, moss lined walls of those gorgeous gorges is with considerable skill, which can only be attained by years of training and practice. The kayaking community knows that and only those who have proven themselves capable are allowed into groups who make the pilgrimage to those sacred waters. Even then, those groups only head down into the gorges when the water levels are desirable for a successful mission. If the conditions are not right we don’t go. For local boaters running “Lowers” as we call it can be a highlight of their entire paddling career; I know its one of mine. To take that opportunity away from future boaters and athletes traveling to our beautiful country would be an insult, to not only the entire kayaking community, but even more so to the beautiful people who passed away undertaking the challenge. Louise passed away in Gnarly Gorge, the middle of the three gorges (Awesome, Gnarly and Smokey), which is commonly portaged (walked around) by the average paddler, as it is the most difficult and consequential of the three. The log she became trapped on was commercially felled and found its way into the river. Instead of closing the river, our duty is stop logs and other debris from unnaturally contaminating the waterways. One way I believe this could be achieved would be to increase the distance from the river where commercial logging is allowed to take place. Another beneficial outcome could possibly involve an annual lowering of the water levels to allow for log removal by the local community. If you give us the opportunity we will leap at it! Paddlers already go to great lengths (rappelling into the gorges at times) to remove hazards from the waterways we love. In conclusion, I implore you to resist the knee jerk reaction to close the Lower gorges of the Kaituna; and instead to preserve and protect the place that Lu and so many other kayakers from around the world have grown to love. Totally agree. Could not have said it better myself.